It was apparent that the community meetings often provided a forum for aggression and argument. 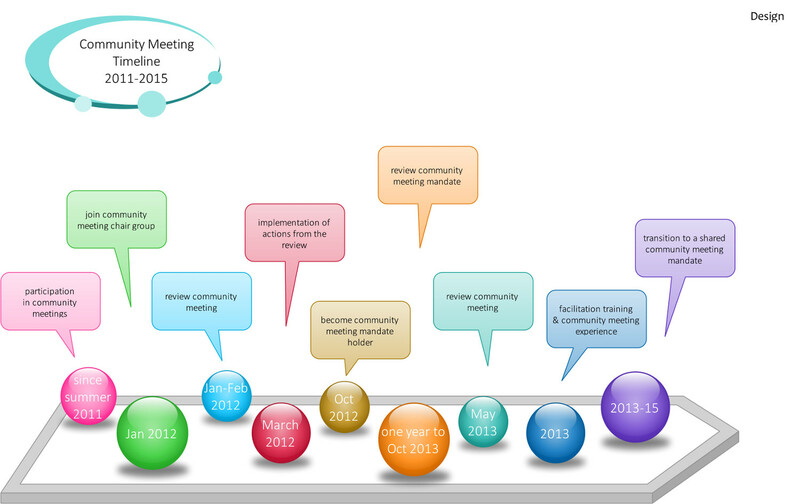 The meetings were often ill-prepared and participants did not have an overview of the topics discussed. Issues were often presented by one person and then another would chip in and tell a very different story. People would often bring items for the agenda and not follow them up. People would often bring issues in an emotional way and participants would also often react very emotionally. There was a core group of people attending meetings with a few who often dominated the meetings. There was a large group of people almost never attending meetings for various reasons, including fear of aggression both verbal and physical, a feeling of not being listened to or a despair at how the meetings function. I had heard many horror stories of community meetings. I had also heard that the meetings had improved a great deal since the founding years. I heard that about five years ago there was a particular structure to the meetings separating out functions, ie there was a business meeting, a social meeting and a study meeting. Personally, I was committed to attending the weekly meetings, but was very nervous when I wanted to speak. I often observed an issue being brought and did not understand the background to it or the main point or question. I observed how some people dominated the meeting. I also noticed the chairs were often challenged and visibly nervous. I had experience of different meeting techniques and was surprised at the format of these meetings in terms of the chair having to keep order, lack of decisions being made, lack of consensus and lack of principles of behaviour and communication. I asked the community meeting mandate holder if I could engage in any way with the management of the community meeting and she suggested I should join the Chair Group, a group of community members who chair the community meeting. They meet up infrequently to discuss chairing. I attended one of their meetings. Here I listened to how they discussed particular community meetings and how they had gone and one of the members was going to withdraw from chairing. There were different philosophies of how to chair, not agreed upon. At this meeting, I proposed to carry out a review of the community meeting, which was agreed on. I informed the community of this review process through the bulletin and invited people to join in designing the review. In the end I worked with two community members: the current community meeting mandate holder and an elder in the community and community life. We designed the sessions together. After each session we reviewed the last and designed with the previous session in mind. This design was collaborative involving a small design group with no permaculture background and then widening out to invite all adult members of Hoathly Hill Community to review, renew and cocreate their meeting space. 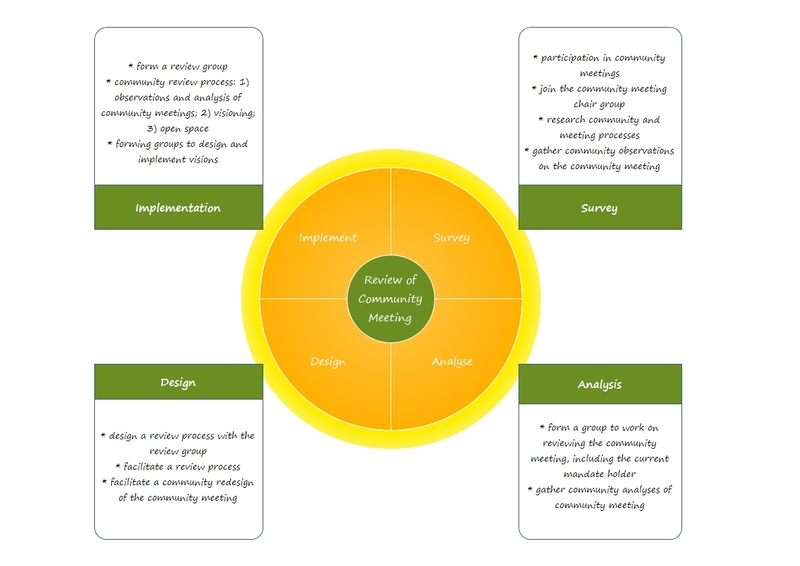 The ethics of people care and fair share featured heavily in that the main aims of the process was to create a safe and participatory space for community members to review the community meeting together. 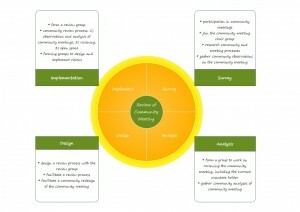 I used the design principles I developed for community design work based on Holmgren’s design principles. creatively use and respond to change: in initiating a review process the question of change arose as a possibility, reactions towards the change need to be worked with, how to transition towards a vision also needed designing.